Created 4 Creativity : You Rock! 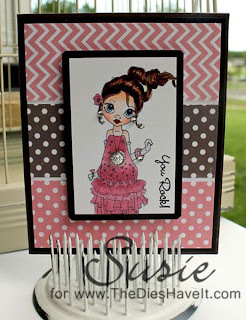 I have a fun girly girl card for you today. My image is called Priscilla Pie and is from the fantastically cool Saturated Canary. I've noticed that sometimes she runs specials on Facebook if you would like to purchase some of her images. Be sure to look her up. I colored her with my Copic markers and added lots of bling from Eyelet Outlet. I hope you are having a wonderful week and that my card brings a smile to your face. Really nice card. Very pretty die you used. Love the added washi tape!